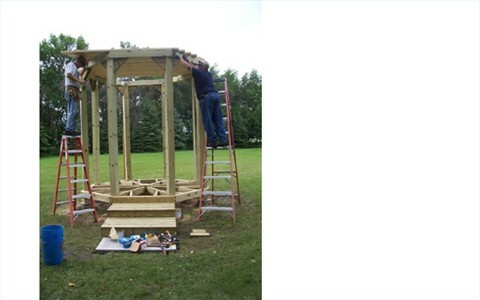 Our main building project one year was to construct a gazebo with the design and work of Noel Rytter from Illinois. Jerry Sauder, Noels wife Jane and daughter Ellen, Marjie, Carrol Ohlsen, James Sells and Jeremy Bertsch were also on hand to help. 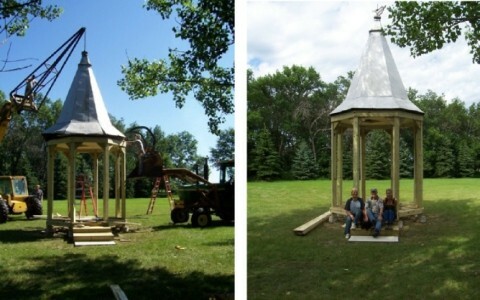 We hired a crane to install the old church steeple on top of the gazebo and have it secured for the winter. 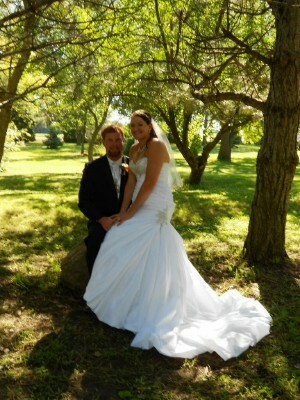 In the spring 2010 we finished the handrails and landscaping. .. while Sadie offers supervisory support. with the drill in building the floor.